The contrasts between the central region and the outskirts of the city of São Paulo were made clear to participants of the Intercontinental Academia (ICA) who took the scientific and cultural tour “Centralities ↔ peripheries” on Sunday, April 19. 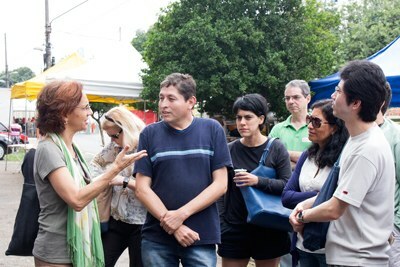 The tour also included an exposition on the relationship between migration flows and interculturality in São Paulo. The tour began downtown, at the Pateo do Collegio, São Paulo’s founding landmark, continued at USP’s Law School in São Francisco Square and the Sé Cathedral. In the second part, participants visited some of the surrounding area and learned a little about specific features of the Pacaembu and Canindé neighborhoods, where they visited the Kantuta Square. The itinerary of the third part included the outskirts – or “periphery” as it’s more commonly called – and, specifically, the Vila Madeiros district, in the North Zone, with a lunch stop at the Mocotó restaurant. Participants also visited USP Leste (the East Zone campus of the University of São Paulo), in Jardim Matarazzo, and the Nutritional Education and Recovery Center (CREN) in Vila Jacuí. The tour was hosted by Sylvia Dantas, coordinator of IEA’s Intercultural Dialogues research group and professor at UNIFESP; Ana Lydia Sawaya, coordinator of IEA’s Nutrition and Poverty research group and professor at UNIFESP as well; Fernando Aith, councilor for the UNESCO Chair on Education for Peace, Human Rights, Democracy and Tolerance (based at the IEA) and professor at USP’s Medical School; and Suzana Pasternak, professor at USP’s School of Architecture and Urbanism (FAU). Dantas explained that São Paulo was built with the help of immigrants from all over the world, especially those of Japanese and Italian descent, who arrived in the first half of the 20th century to meet the demand for agricultural and industrial labor, and who exerted great influence in the city’s cultural milieu. According to her, in recent decades the city has been experiencing new immigration flows, particularly of Bolivians, who already number more than 300,000. Attracted by the growth of the Brazilian economy, these immigrants come to São Paulo in search of jobs and a better life. Many of them are in the country illegally and are submitted to degrading working conditions, low pay and exhausting work in clothing sweatshops in the Bom Retiro and Brás districts. The ICA participants had the opportunity to learn more about the universe of these immigrants in Kantuta Square, where a Bolivian street market attracts nearly 3,000 people every Sunday to enjoy typical foods, crafts, folklore and dances from different regions of Bolivia. Rodrigo González, vice-president of the Padre Bento Bolivian Gastronomic, Cultural and Folklore Association, which organizes the market, spoke to the researchers about the importance of the weekly event to pass on Bolivian culture to newer generations, already born in Brazil, and to promote cultural exchanges with Brazilians and with other Latin American immigrants. As they passed through the Pacaembu neighborhood, Martin Grossmann, IEA’s director, explained the architectural plan of the region. Based on the “garden city” concept, the project was inspired by British architecture of the Victorian era and sought to respect the natural topography, resulting in sinuous streets and houses with large lots and ample gardens. 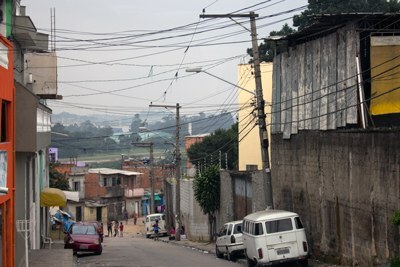 Grossmann noted that this type of urban development, in a neighborhood reserved for São Paulo’s elite, contrasts with the precarious housing in the city center, where drug addicts and the homeless sleep on sidewalks or squat empty buildings, resisting the movement to expel low-income residents from downtown. Aith stressed that the contrast is one of the effects of São Paulo’s accelerated growth, especially since the 1950s. Over this period, the process of uncontrolled urbanization was intensified, with a chaotic occupation of urban spaces splitting the city in two different worlds: a “lawful” city, benefitted with urban planning, regular housing and public services such as transport, water mains, electricity, schools and hospitals; and an “unlawful” city, always growing towards the periphery, in the midst of great poverty, giving rise to slums and to all kinds of substandard housing. According to the councilor, in the lawful city, the difficulty of having access to regular housing, derived from São Paulo’s deep socioeconomic inequalities, pushes the poor to ever more distant places, with inadequate adequate transportation, health, sanitation and educational infrastructure. In these remote areas, the people occupy land that belongs to others (private owners or the State) and embark on “self-constructions” – houses made of cheap material and built with the labor of friends and neighbors. Aith stressed that only when these illegal occupations are already at an advanced, irreversible stage does the State take action to “legalize” them by means of redevelopment projects. The transition between the lawful city and the unlawful city was observed as the tour advanced towards the outskirts. In Vila Medeiros, the ICA researchers found an example of an urbanized suburb, an entire neighborhood that had actually begun as an irregular occupation. In the vicinity of USP Leste, they saw ramshackle houses built inside an ecological park, where construction is supposedly forbidden by environmental laws. The group obtained a more detailed picture of living conditions in the periphery from Sawaya’s exposition on the work of the CREN in Vila Jacuí, a neighborhood that emerged from the illegal occupation of an area of fountainheads that is part of an ecological reserve. Although it has been “reurbanized,” Vila Jacuí still lacks public infrastructure and services, and is overwhelmed by drug trafficking. With one of the lowest Human Development Index (HDI) in São Paulo’s East Zone, the district’s CREN is one of the few instruments to improve the population’s quality of life. The CREN operates there since 1993, combating and preventing both malnutrition and obesity in children and adolescents, offering nutritional assessment programs, development and learning evaluation, treatment for infections, education, and insertion into the world of culture. To these ends, it has a day hospital that treats nearly 100 children, offering them five balanced meals a day. Besides contributing to the nutritional and educational recovery of children and adolescents, the CREN is also a place for family gatherings and the practice different activities. Computers are available to the community, as well as a fully equipped playroom and the infrastructure for physical and cultural activities (music, theater, dance and sports). Sawaya, who is former coordinator and current scientific director of the CREN, stressed the importance of the project as an initiative to develop youth participation and provide opportunities for children and young people to move away from crime. According to her, of the people who attend the center, 60% have a family member in prison and 70% have a relative addicted to drugs or alcohol. She also pointed out that over its 23 years of operation, the project has helped 3 million children and contributed to substantially reduce the number of murders in the environs.